I've been thinking about drawing style for a while now. Phoenix Feathers is optimised for speed - I try to make it as good as possible, but if I were to treat it the way I do the First Story (more specifically chapter 3), you'd get an update once every two weeks, not twice a week. It takes a long time to draw, ink, scan and colour each picture of a page of the First Story (and that's greyscale). 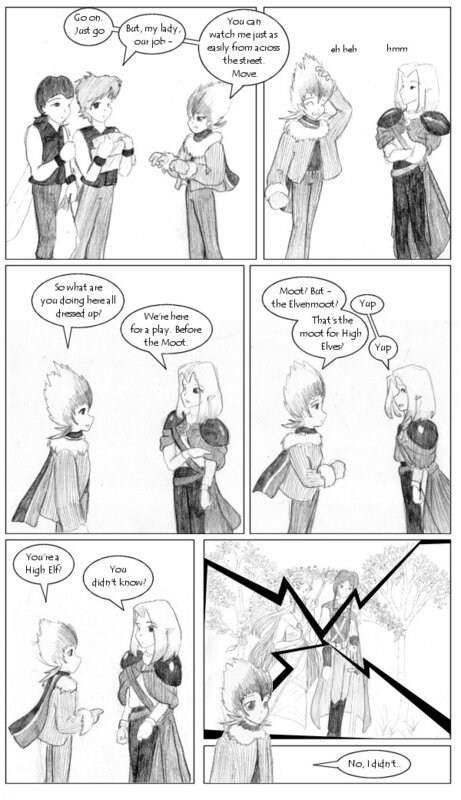 The Eversummer Eve webcomic has the same problem, but the artist offers one (really well-drawn and coloured) page a week, rather than two scruffy ones a week. Piro of Megatokyo, of course, is someone who draws in pencil (three times a week) and makes it clean and neat, so at least I know it's theoretically possible. At the anime session last Wednesday, the Hologram brought a copy of How to Draw Manga 2, which concentrated on backgrounds, perspective and tone rather than drawing characters (that's book 1). It was very interesting to flip through. I knew in a vague way that professional comics are done with tone sheets that are rubbed onto the page but I hadn't much idea beyond that. It does sound like it would be faster than computer colouring although not as fast as pencil only. I'm toying with the idea of trying it (and with trying black and white inking, as done in Girl Genius 1) but I suspect I'd still drift back to my pencils. I have a decent watercolour set, and oils and pastels too, as well as coloured pencils and PSP7, and I *still* draw in pencil on white paper, very rarely colouring anything. I'd really like to have Phoenix Feathers looking neat and good, but I think I'm most likely to achieve that with pencils, not with assorted weird and wonderful techniques. However, I could try it on the First Story, which has become somewhat of a guinea-pig for me to try styles on.